Furniture There are 38 products. 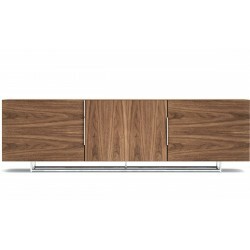 Nelson Thin Edge Buffet Designed by George Nelson for Herman Miller® This richly veneered buffet not only looks and feels exquisite, but it also offers a high degree of utility. Hinged doors house two adjustable shelves and four deep drawers—all with soft-closing slides—provide functional storage for dining or meeting rooms . Designed by Charles and Ray Eames for Herman Miller® A timeless classic, the Eames Lounge Chair and Ottoman was introduced in 1956. At the time, there was nothing like it—and all these years later, that's still the case. It's no wonder the design has been in high demand and continuous production ever since. 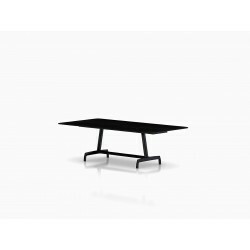 Designed by Leon Ransmeier for Herman Miller® A sculptural plane 29 inches above ground level, the AGL Table, in its 48"x95" conference configuration, makes a stunning dining or meeting room table. Defined by its soft, welcoming edge and efficient understructure, it communicates sophistication and intelligence. 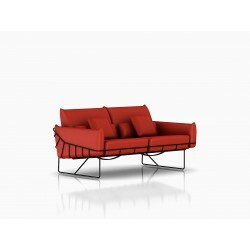 Wireframe Sofa The Wireframe Sofa by designers Sam Hecht and Kim Colin reflects how we live today. Lightweight and versatile, Wireframe shifts with ease to meet the continually evolving needs of a space, and the people who work and relax in it. 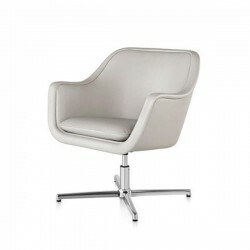 Designed by George Nelson for Herman Miller® Additional Information With its gentle sweep and excellent lumbar support, comfort is paramount in the Bumper Chair’s deceptively simple, nearly seam free design. Eames Sofa Compact Designed by Charles and Ray Eames for Herman Miller® What's compact about a sofa that's 6 feet wide and seats three adults comfortably? Not your upholstery options; they're numerous. Not comfort either. Although the sofa extends only 2.5 feet from a wall, it offers support from shoulders to knees. Designed by Charles and Ray Eames for Herman Miller® The Eames Aluminum Group Executive Chair has a high back and a sophisticated, refined aesthetic that sits well in all kinds of home office and business settings. The pneumatic lift and a tilt-swivel mechanism let you adjust the chair to suit you and your work. Designed by George Nelson for Herman Miller® In 1946, George Nelson designed a series of modular storage units, which included this compact, solid wood cabinet. It features three drawers to easily tuck away items, and is available in a choice of two finishes, with or without legs. Designed by Don Chadwick and Bill Stumpf for Herman Miller® Aeron is the perfect marriage of performance and design. Our best-selling office chair still defines expectations for ergonomic comfort more than 20 years after its debut. Noguchi Rudder Table Designed by Isamu Noguchi for Herman Miller® This sculptural coffee table designed by Isamu Noguchi is an updated archival design from 1949. Its two chrome hairpin legs and one wood leg, the shape of which is reminiscent of a ship's rudder, provide a balanced asymmetry.